Beijing, March 19: The first remote surgery on a human using 5G technology was successfully conducted in China. The surgery, a collaboration between tech companies Huawei and China Mobile, and the Chinese PLA General Hospital, was conducted on Saturday, the Global Times reported. According to the paper, Surgeon Ling Zhipei conducted the surgery, although he was physically in South China's Hainan Province. "He implanted a neuro-stimulator, or 'brain pacemaker' into a patient with Parkinson's disease at the Chinese PLA General Hospital in Beijing by operating medical equipment through transmitted images supported by 5G technologies. The procedure lasted three hours," the paper reported. The process was made possible with the low-latency 5G technology provided by Huawei and China Mobile, which enabled near instantaneous data transmission, it said. The World’s First-in-Human Telerobotic Coronary Intervention Performed in India. "It felt like a real-time operation -- I didn't even feel like the patient was 3,000 kms away," Ling said after the surgery, according to a statement released by China Mobile. The patient's symptoms, including limb tremor and muscular stiffness, were significantly relieved after the procedure. The patient is in stable condition, it added. 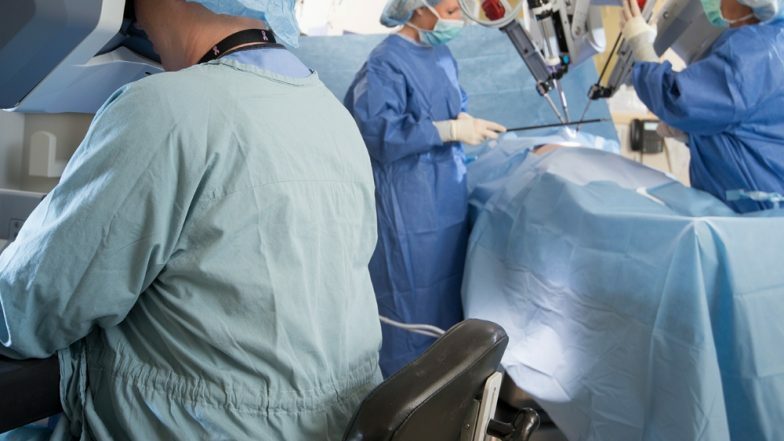 5G technology was used in a surgery conducted on a pig last year, when a doctor from 301 Hospital in Beijing removed part of a pig's liver using two robot arms in Fuzhou, the capital of East China's Fujian Province. It was the world's first remote surgery using 5G mobile network technology on an animal, the paper said.